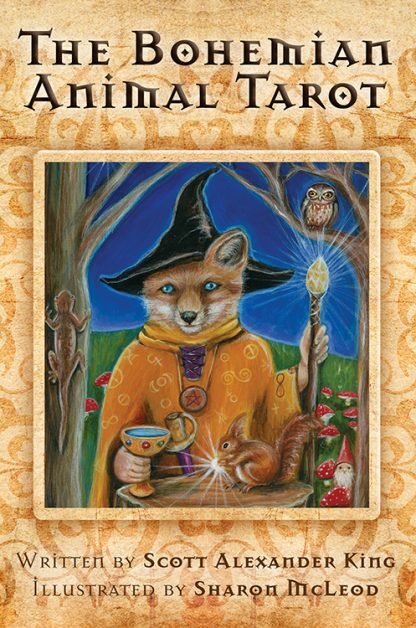 The Bohemian Animal Tarot offers a totally unique tarot experience. Representing our archetypal aspects as part human and part animal, it explores the fundamental types of people and life situations entrenched in the collective psyche of all people. The humanistic qualities of the Major Arcana may also symbolically represent our emotional and spiritual development from the newborn infant to adult, while the animalistic side could be said to mirror our inherent primordial strengths and weaknesses. The card artwork blends 15th-century Tudor- and Elizabethan-inspired costume styles with classical late Baroque, Victorian, and French themes and a touch of Romany Gypsy�a totally unique tarot experience! Scott Alexander King is a Shaman, Visionary and Zoomancer � an individual that examines the habits and appearance of animals to help explain or reveal the future path of other people. He is also Australia�s best known and most respected expert on Animal totems and symbology and the author of several bestselling titles including Animal Dreaming, Animal Dreaming Oracle Cards, Earth Mother Dreaming, and World Animal Dreaming Cards. Sharon Mcleod was born an artist. Deeply inspired by Nature, the goddess in her many forms and the existence of Faeries, Sharon�s great-grandmother taught her many of the old ways of the Anglo-Saxon Gypsy. With a bloodline that goes way back through Poland to the Romany Gypsies on her mother�s side, and to the McLeod�s mystical blood of the Faeries on her father�s, Sharon naturally loves �all things Gypsy�; from gypsy caravans, tarot cards, magicians, cupid dolls to the myriad of curious circus performers that many Gypsies became. She is famous for her illustrations in Witchcraft Magazine and Europe�s Fae Magazine. Sharon and her two girls live a bohemian life in Queensland�s beautiful Springbrook region, where they eat from their organic vegetable garden and spend the days painting and drawing.